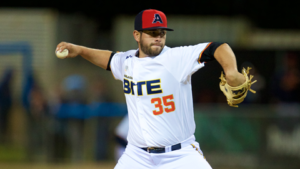 Adelaide has put a dent in Sydney’s hopes of securing a home playoff series with a shutout 3-0 win in game one of their Brut Australian Baseball League series at West Beach on Thursday night . 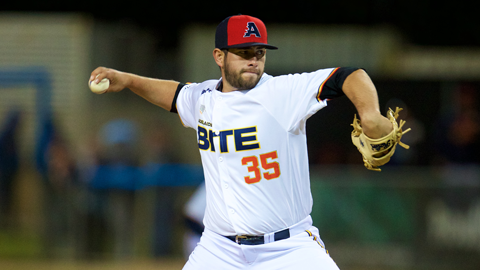 In an all-European pitching matchup between two of the ABL’s best, it was the Bite (18-19) and German Markus Solbach who prevailed over the Blue Sox (23-14) and Italian hurler Alex Maestri. Both starters put up three scoreless innings before the home team broke through in the fourth when Adelaide centre fielder Aaron Whitefield scored on Michael Gettys’ two-out double to left field. Adelaide then added to its lead when Nicholas Shumpert drove a run home in the fifth and catcher Mitch Edwards had an RBI-single in the seventh. In his final Bite appearance for the season, Solbach was lifted in the fourth inning to loud applause from the home fans in a brief start in which he broke the Bite record for strikeouts thrown in a season. The recent LA Dodgers signing allowed no runs on three hits and two walks whilst striking out four in three and a third innings. He was well supported by his bullpen who threw 5 2/3 scoreless innings en route to shutting out the Blue Sox. Jorge Perez worked 2 2/3 innings and Ryan Chaffe completed a six-out save, his fifth of the season. Sydney starter Maestri threw six innings, allowing two earned runs on three hits and four walk whilst punching out five hitters. Blue Sox shortstop and recent Philadelphia Phillies signing Gift Ngoepe continued his impressive season with two hits for the visitors. The loss cut Sydney’s lead at the top of the North-East Division to one game. The Sox will look to respond when the series continues on Friday when the Bite host Strikeout Cancer night at West Beach. First pitch is scheduled for 7:20pm local time.